Glyphosate became an herbicide in 1971 and is now the most widely used herbicide in food and agricultural production. For that reason, this powerful and efficient herbicide has numerous applications, making Monsanto, it’s manufacturer, quite successful. 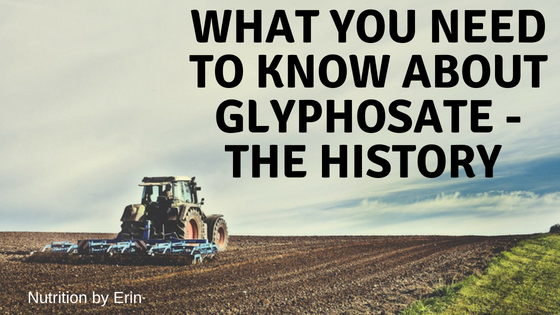 This article dives deep into the background of glyphosate including its history, benefits, and issues with contamination and other potential risks. Glyphosate is the active ingredient in Roundup, a weed and grass killer. People utilize it on unwanted weeds or vegetation to help plants flourish. Dr. Henri Martin, a Swiss chemist, first discovered glyphosate in 1950 (1). Since then, glyphosate has quite versatile purposes. In 1964, glyphosate was first used as a chelator. Essentially, it was able to remove unwanted mineral deposits like iron, manganese, boron and zinc from metal pipes (2). In 1974, Roundup by Monsanto, the herbicide containing glyphosate, was first sold to consumers. However, people were only able to use it where they didn’t want anything to grow. This was because it was so successful in killing plants (1). 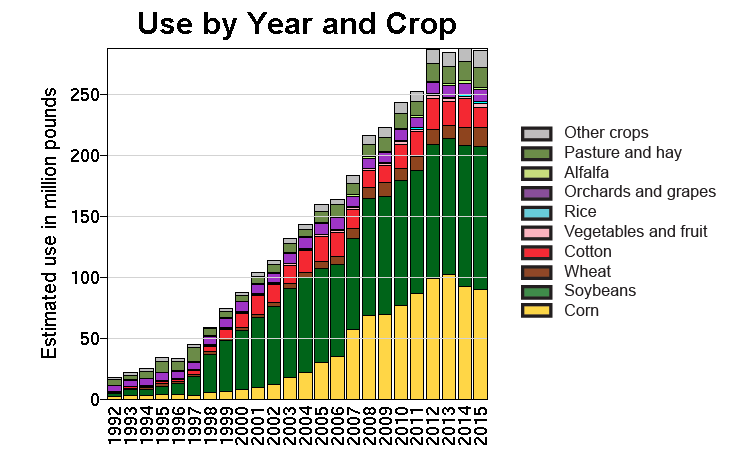 Glyphosate’s use skyrocketed in 1996. 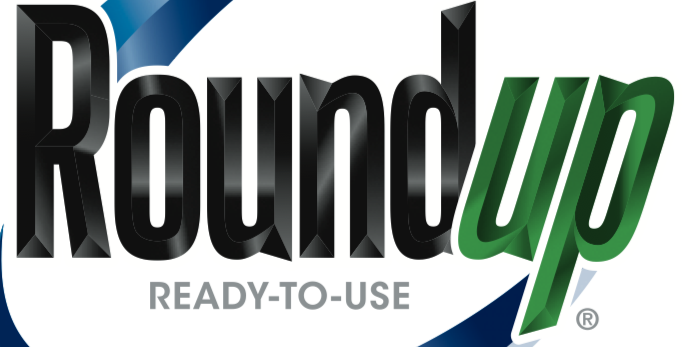 Roundup Ready was introduced and farmers used it on their genetically engineered (GE) crops. These crops are engineered to withstand glyphosate while the weeds surrounding it die off. Since 2010, glyphosate has approval to act as an antibiotic. This is because it inhibits a pathway that our gut bacteria uses. SUMMARY: GLYPHOSATE IS USED AS A CHELATOR, HERBICIDE, AND ANTIMICROBIAL AGENT. IT IS THE MAIN INGREDIENT IN ROUNDUP READY, THE WORLD’S MOST WELL KNOWN HERBICIDE. There are some benefits to farmers who use glyphosate on their genetically modified crops. Most importantly, glyphosate is reportedly cost effective and an easier weed control method for farmers (3). Monsanto states that due to the use of spraying glyphosate on the GE crops, farmers can reduce the need for alternative labor in removing the weeds like tillage and hand picking. Tillage means that farmers can plant a soybean crop immediately after a wheat crop in the same season without tilling (3). This supposedly results in more crop production and increased income for farmers. As a result of the GE soybean crops and glyphosate use, farm income has increased by $3.82 billion (3). SUMMARY: FARMERS FIND THAT THE USE OF GLYPHOSATE AND GE CROPS HAVE INCREASED INCOME, REDUCED LABOR, AND INCREASED MORE PRODUCTION OF CROPS. Research has shown in rats that consumption of around 0.1 ppb per day can result in liver and kidney damage. An expert in studying glyphosate, Dr. Stephanie Seneff, associates the rise in glyphosate with the rise in celiac disease. Celiac disease can be associated with many other illnesses like hypothyroidism, cancer, kidney disease, increased risk of birth defects, and infertility (7). SUMMARY: GLYPHOSATE CONSUMPTION MAY INCREASE THE RISK OF MANY ILLNESSES. THE ILLNESSES VARY FROM CANCER TO DISRUPTING THE MICROBIOME. GE corn, soy, alfalfa, sugar beets, and canola utilize glyphosate the most (4). Consequently, glyphosate is in many popular processed foods. This includes brands like General Mills Cheerios and Annie’s, Kellogg’s Kashi, Cheez its, and Special K, Nabisco Oreos, Pepsico Doritos, and Whole Foods 365. Not only is it in these products, but it can also unintentionally contaminate rainwater. It can end up in organic foods from other crops due to runoff water. Unfortunately, glyphosate absorbs into the plant’s cells. Therefore, you’re not able to remove the glyphosate from the food by washing, peeling, baking, or brewing. SUMMARY: GLYPHOSATE IS EVERYWHERE. IT IS IN ALMOST EVERYTHING INCLUDING PROCESSED FOODS, ORGANIC FOODS, RAINWATER, AND BREASTMILK. How much glyphosate consumption is acceptable? The U.S Environmental Protection Agency (EPA) has issued an acceptable daily intake (ADI) or safety threshold of glyphosate consumption of 1.75 mg/kg of body weight per day (5). For a 75kg man (165 lb), this equates to around 131 mg daily. This is about 1750 ppb (parts per billion) per day. Numerous other countries disagree with the US ADI of glyphosate. The ADI in Europe is 0.3 mg/kg of body weight. For a 75kg man, this equates to 2.25 mg daily. This is about 300 ppb. How much glyphosate are we consuming? Research has shown that about 93% of 131 urine samples tested for glyphosate at 3.096 ppb on average. Not only was the average ppb high in this study, but children had higher glyphosate levels in their urine than adults. This could be due to most processed foods containing higher amounts like non-GMO, gluten free Cheerios that have around 1125.3 ppb per serving. While there are many benefits to glyphosate use for consumers and farmers, the high consumption of glyphosate in the food products and rainwater can create potential health risks in humans. Stay tuned for the next article where you’ll learn more about these potential health concerns of glyphosate consumption. The Surprising Truth About Glyphosate: Should You Fear It?